How did this patient hear about the Riverside? Hospital Social Worker. Coach T was admitted to The Riverside from NYU Langone Medical Center on April 25th, 2018. On the 7th of April, Coach T’s roommate found him lying on the floor unconscious. He immediately called 911. EMS arrived, and Coach T was taken to NYU Langone Medical Center. At the hospital, he informed the team of his medical history and spoke about the events leading to being found on the floor. He was returning from a stressful day at work and had to walk up multiple flights of stairs to reach his apartment. While he was ascending the stairs, he began to feel severe chest pain. After a few steps he found himself short of breath and experiencing continued chest pain. After hearing his medical history and the events leading to him being found, the team at NYU Cardiology unit began a series of tests. Coach T would benefit from continued therapy for endurance training and breathing exercises. Social workers at the hospital gave Coach T a list of skilled nursing communities to choose from, which could provide reconditioning and healing and ultimately return back to his daily life as a coach of a popular college sports team. Coach T’s top pick was Team Riverside. Upon arrival to The Riverside, Coach T was greeted with open arms by the 14th floor staff members. Each department sent representatives to greet Coach T, answering his questions and concerns. The concierge greeted him with a welcome booklet and welcome gift. The concierge representative assured him that any inquiries or questions would be handled quickly and efficiently. The Riverside’s therapy team met with Coach T to map out a game plan to treat each issue. The staff quickly saw a more motivated Coach T as they heard him speak his mind. He would set the tone for each session and when he was not with his therapist, he would spend time practicing. One large challenge was his breathing. Concierge arranged for Urban Zen to see him right away. Urban Zen used their talents to help Coach T to become self-aware while breathing. At the end of his first week of therapy, Coach T began to see results. While Coach T was resting in between sessions, he was busy studying as he is currently enrolled full time in a prominent Law School. Recovering from health issues is a challenge in itself; attending Law School full time is an even greater challenge. The combination of the two is the definition of herculean, and truly inspiring for everyone that met Coach T. He never missed a lecture, never missed an assignment, and never stopped practicing the techniques each therapist taught him. Coach T was excelling with every week that passed by. He was ambulating with minimal assistance of only one person, walking over 75 feet, going up and down stairs, and at the same time, is receiving A’s in each school assignment. 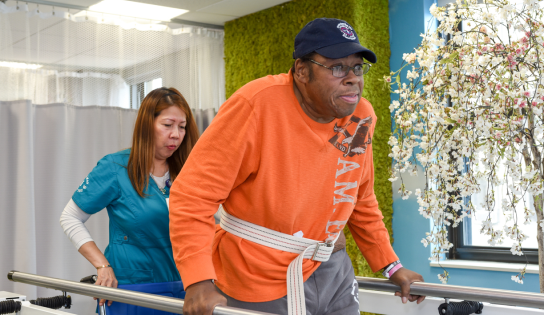 On the 28th of June, Coach T had a Cardiac Ablation performed on him at NYU Langone Medical Center. As of June 29th, he is currently recovering from his surgery. His beloved team stopped in to visit and welcome him back when he returned to The Riverside. On the 30th, Coach T will resume his intense therapy and is confident that he will make a full recovery! Coach T has been an inspiration and motivation for each person he has encountered along his journey.